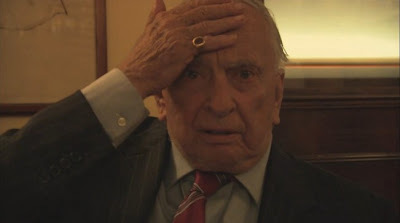 Gore Vidal is a hero of mine. Like Lenny Bruce and a few others he spoke his mind and told the truth or what he saw as the truth. He not only spoke the truth but he did so intelligently and wittily which made me laugh while I was swallowing a bitter pill. Telling the story of Vidal from birth to death the film pulls no punches dealing with every aspect of his life from his mother problems, to homosexuality, to his runs from congress to his bestsellers and on and on. the film is a perfect primer to learn about the man and his body of work and thought. As a fan I was in heaven getting to watch things like his legendary battles with William F Buckley and Norman Mailer again. I also got a chance to simply listen to him talk about the world and life in a way that no one else ever did. It was like a greatest hits album of an intellectual. To be honest there was a point about about half way in when I realized that the film wasn't perfect. While the film is a primer on Vidal there is also a sense that things while we get a great view of the man himself, we don't get very much of his thoughts beyond the big points. Yes I know its hard to condense much of what the man said to manageable bits (I always enjoyed just listening to him speak and going off on a subject) but at the same time the film only runs 89minutes which means more material could have been inserted and still not had the film get too long.Yes I know I'm arguing about what is probably a trivial matter since the film is excellent as is, it's just there is so much more we could have heard him say. Minor reservation aside, a must see film.